Caitlin is a volunteer Presenter with ANZGOG’s Survivors Teaching Students, an ovarian cancer awareness program that brings the faces and voices of ovarian cancer survivors and caregivers into the classrooms of health professional students to teach them about women’s experiences with the disease. Find out more about becoming a volunteer with Survivors Teaching Students. “The STS program appealed to me on a number of levels. Firstly, it helps me achieve my goal of raising awareness of the disease. 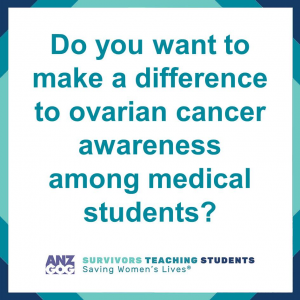 I also feel as though I am saving lives, as our future doctors and nurses are learning more about ovarian cancer and the many different ways in which it presents, which could lead to earlier detection. “Secondly, I have always been passionate about best practice in health care, having worked in top IVF clinics around the world. I am passionate about not only excellent outcomes for patients, but also the patient journey. I feel that by hearing patients stories first hand, health practitioners are getting the best feedback and information possible. They can learn about how to listen to patients, detect disease earlier, and how to empathise and communicate well. The ANZGOG: Survivors Teaching Students project is a Cancer Australia Supporting people with cancer Grant initiative, funded by the Australian Government. The program is affiliated with Ovarian Cancer Australia to extend reach. “By helping others, I feel like I am not hopeless, and that my cancer can be used for a greater cause” says Caitlin.